A country's income depends on its accumulated wealth and how efficiently and innovatively this wealth is employed to produce goods and services. Does what a country produce matters? Are there constraints or drivers of wealth accumulation that can be associated with specific economic activities within a country? The question is as old as development economics. Is specialization in producing (mineral or agricultural) commodities inherently more limiting than producing manufactures? More recently, the question has been extended to a contraposition between manufactures and services. The financial sector and the production of financial services have also become the subject of such questions. How healthy and dynamic is an economy when it exhibits rising proportions of employment and GDP in financial activities? Are there limits to credit-to-GDP, or any other measure of financial sector outputs, after which growth dynamics tends to be harmed? Financial markets and institutions arise to mitigate the effects of information and transaction costs that prevent direct pooling and investment of society's savings ... Financial systems help mobilize and pool savings, provide payments services that facilitate the exchange of goods and services, produce and process information about investors and investment projects to enable efficient allocation of funds, monitor investments and exert corporate governance after these funds are allocated, and help diversify, transform and manage risk. Therefore, except for the case of very small economies that import most of the financial services they use as inputs, any other economy will likely feature a relative rise of financial activities and value added vis-à-vis the rest of the economy as it climbs up the income ladder. Some small economies may even specialize in providing financial services to the rest of the world. Importantly, the expansion of finance is not a by-product of growth, and, as Asli observes, the causality runs stronger on the opposite direction. ... as is the case with many things in life, with finance you can have too much of a good thing. That is, at low levels, a larger financial system goes hand in hand with higher productivity growth. But there comes a point -- one that many advanced economies passed long ago -- where more banking and more credit are associated with lower growth." ... the central role that financial institutions play in economic volatility and downturns, namely that financial depth (as measured by private credit to GDP) reduces volatility up to a point, but too much private credit can increase volatility. The financial sector can also exacerbate periods of downturns, particularly if debt increases relative to equity. 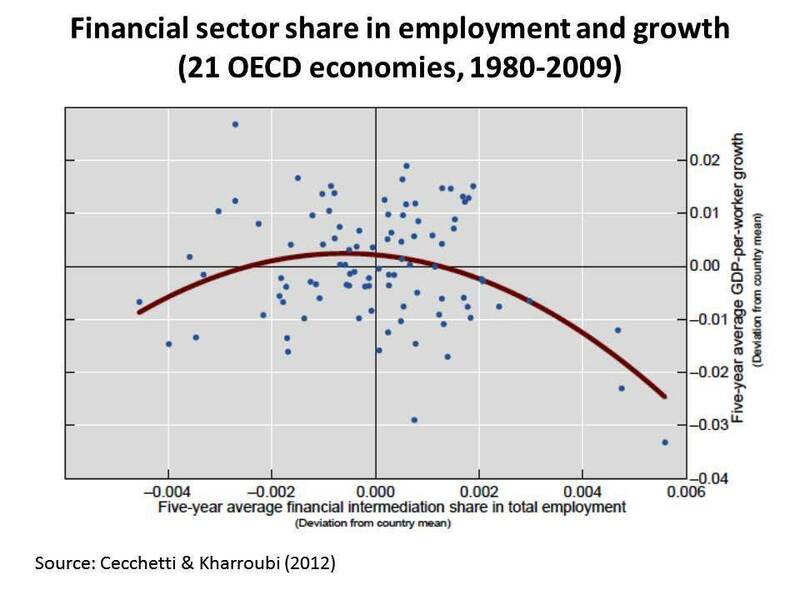 The provocative result obtained by Cecchetti and Kharroubi is, in my view, the one illustrated in Chart 1, namely an inverted U-shaped effect of financial sector shares in employment on growth. They present an empirical exercise in favor of the assertive that, while at low levels increases in the financial sector's share in total employment are positively related to rising GDP-per-worker growth, a larger financial sector becomes a drag on productivity growth after a certain threshold. It is not just a matter of perils inherent in a dependency on an activity more subject to booms and busts -- as Iceland, Ireland, Cyprus and many other countries know well by now. The BIS authors note the competition for -- and crowding out of -- scarce resources (physical capital, highly skilled workers) from other activities. Here, resembling the debates mentioned at the beginning of this text, there is a presumption that the "economic value" at the margin and the scope for productivity increases in the financial sector are smaller than in other activities, at least after a certain point. By the same token, the extraordinary gains in the financial sector in most advanced economies up to the crisis would have been more of a "rent" (extractive) nature than the reflection of an equivalent value added in terms of GDP and wealth accumulation. Cholesterol performs important functions in your body. It aids in tissue and hormone formation. It protects your nerves. It helps with digestion. In fact, cholesterol helps form the structure of every cell in your body. But too much LDL -- or 'bad' -- cholesterol and not enough HDL -- or 'good' -- cholesterol may lead to heart disease and stroke. To help avoid these problems, you need to maintain the proper ratio between good and total cholesterol. In other words, finance is good for growth. But too much of it can be a bad thing. While it may sound extreme, the analogy cannot be pushed too far! As pointed out by Martin Cihák, Asli Demirgüç-Kunt, Erik Feyen and Ross Levine, the unevenness of sizes of national finance systems -- depicted in Chart 2 -- reflects, among other things, different institutional settings and the multidimensional nature of financial systems: this includes the size of financial institutions and markets, degrees of access, efficiency, and stability of institutions and markets. Optimum levels of finance vary over time and among countries. Not by chance, the empirical exercise done by Cecchetti and Kharroubi (Chart 1) used country-specific deviations from their own means of employment share in finance as the variable correlated with growth. Note: Calculations based on the Global Financial Development Database. The map is for illustration purposes only. Sizes of the various jurisdictions are adjusted to reflect the volume of their financial sector assets, in US dollars at the end of 2010. The image was created with the help of MapWindow 4 and ScapeToad software. So, there seems to be a country-specific threshold of "too much" finance at each point in time, one that moves over time depending on the local institutional evolution and also varies substantially among countries. What is the remedy? A doctor does not prescribe a one size fit all approach that simply matches a patient's levels of cholesterol with some benchmark: they also take into account other health aspects of an individual's lifestyle. And for financial regulators and policymakers treating their "patients" is also a balancing act to determine how much finance is just enough at each stage of a country's development! The author would like to thank Asli Demirgüç-Kunt and Matheus Cavallari for their comments.